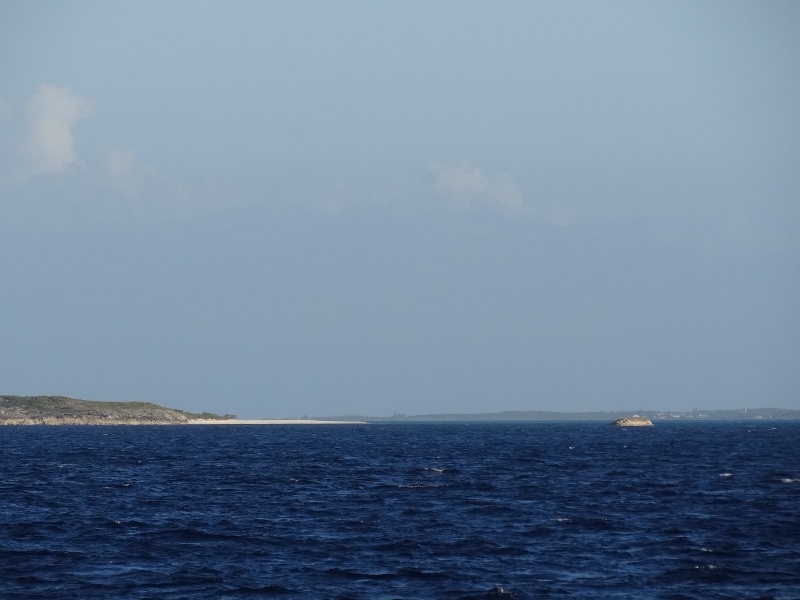 The move, all one mile (probably less) of it brought us over the two anchoring spots on the cay’s west (protected) side. The preferred place was off of Two Palms Beach, which sadly now is only One Palm Beach. I wonder how long the charts will still keep it as Two Palms? We know it’s been one for at least a year. 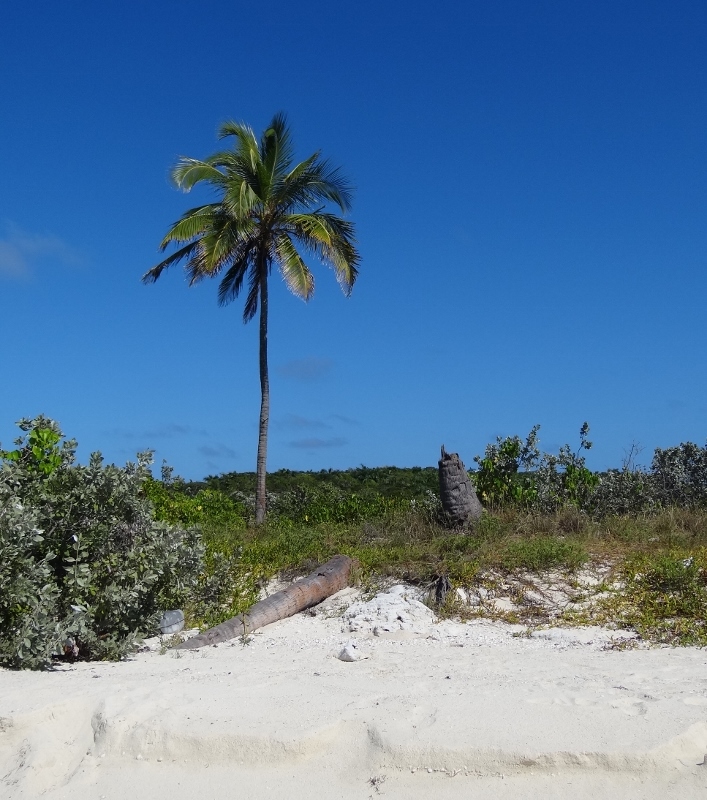 Two cats- our Aussie friends from Water Cay- were there already so we snuck in next to a monohull and in front of another in 8ft of water with a sandy bottom at the next beach. 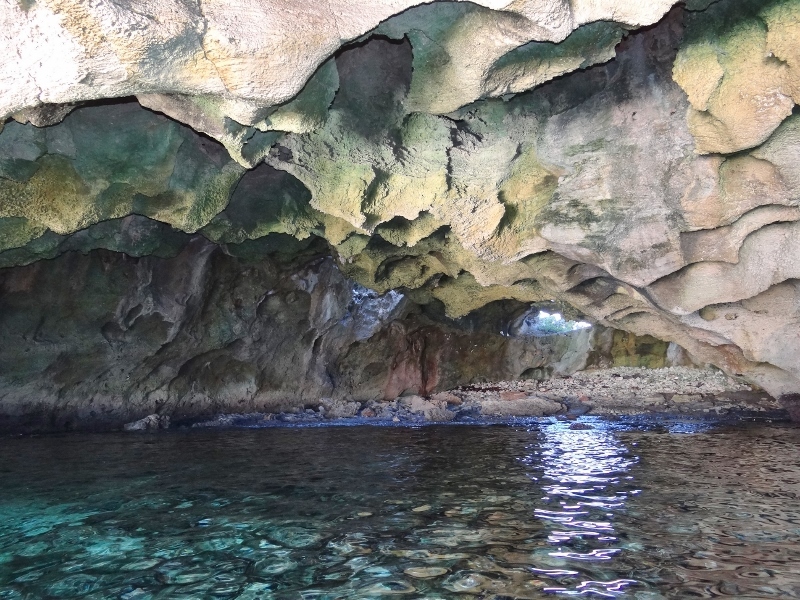 First stop, the dinghy drive-in cave just around the corner. 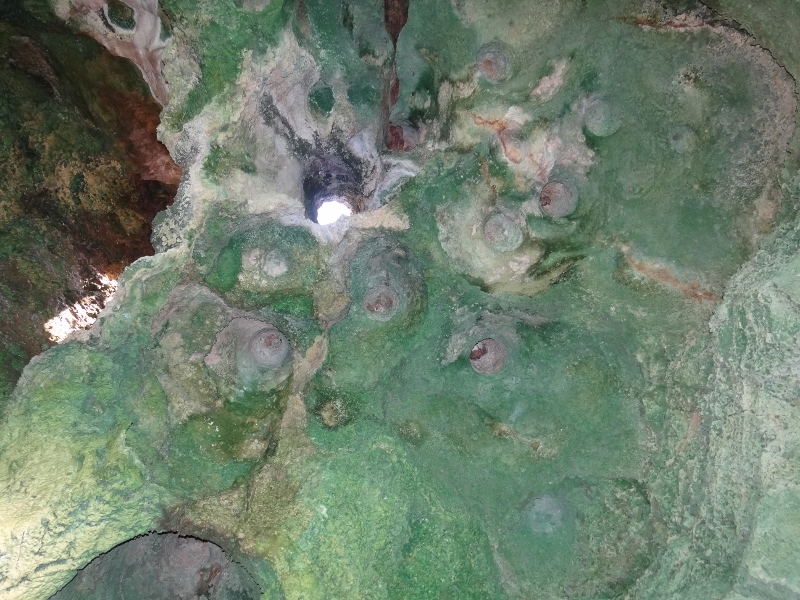 Visions of Thunderball Grotto appeared in our heads as we approached and cautiously entered the large cave with stalactites and sky lights. We’d walked Two Palms Beach earlier so landed Bunting on the beach in front of us. Our senses heightened thanks to our osprey friends the day before, we swear we could hear an osprey cry and as we looked up at the abandoned light on the hill, there sat an osprey at the top. Or was it? I snapped a picture anyway. The beach offered several small conch shells to add to those I’d picked up the other day and we found the path up to the light. You know, the small white light with the small solar panel that viewed from a distance at the right angle looks like an osprey. Yes, that one. We did get a photo of Ortolan at anchor but the sun was right in the way, so it wasn’t blog worthy. 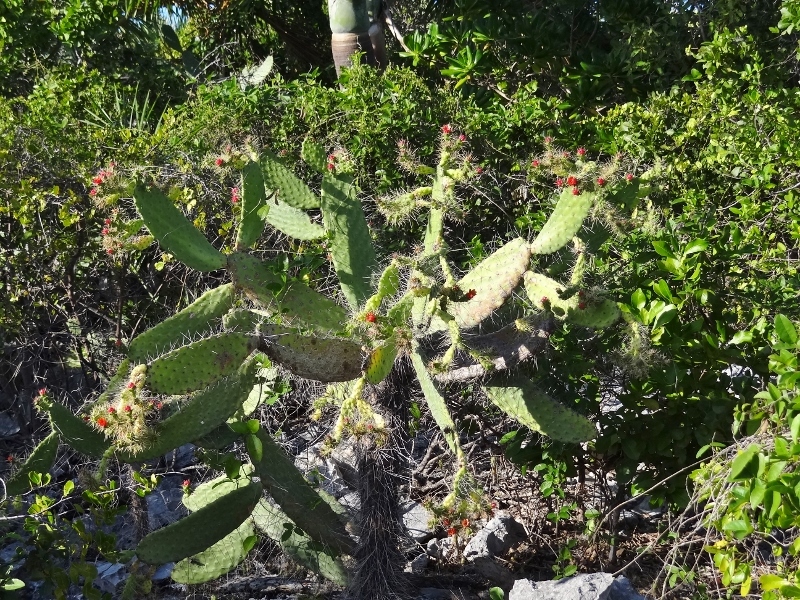 The cactus grew well and wide on the hillside, one with flowers and another with large plum-like fruits on the leaves. Perhaps a prickly-pear? 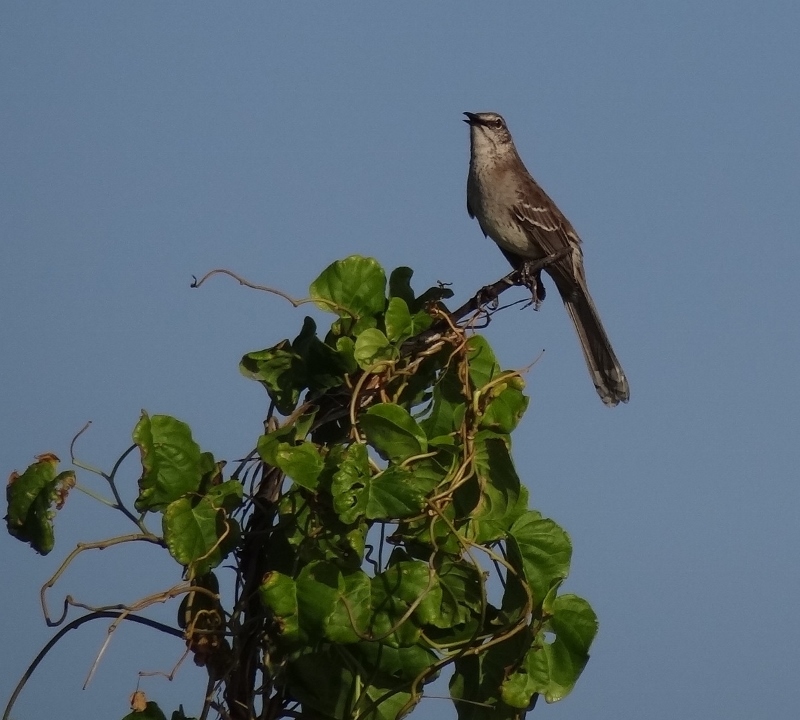 While I did one last beach tour, Russ hung out and got awesome shots of some very vocal birds. About that swell; better after we moved over, but worsened throughout the night as the wind picked up. Happy that we’d moved. Come Wednesday, once we got underway flying those white hankies and moving along at 8kts on a beam reach, the swell was inconsequential. Free Bird provided an updated forecast that indicated more wind (yeah- like right now) and staying upwards of 18kts for at least five days. No front in sight though which always makes us very happy. 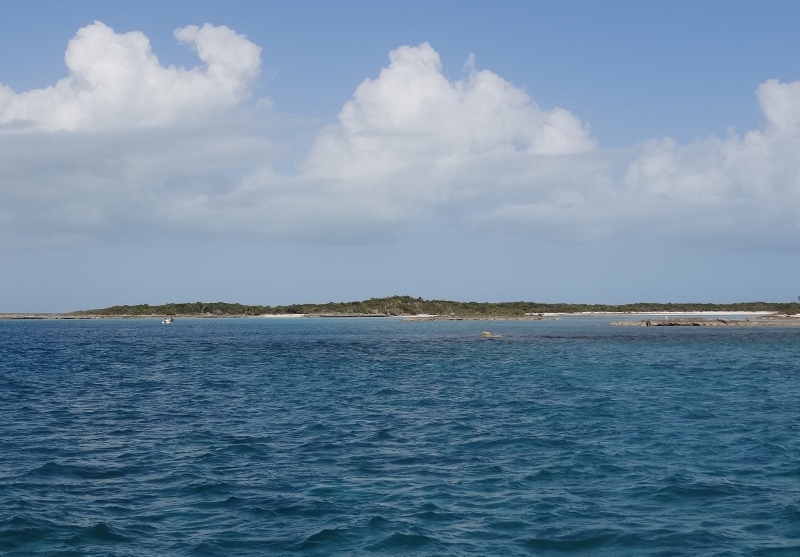 The tricky part of our return trip to George Town was transiting Hog Cay cut but not at low tide or within 2 hours of it; but that’s assuming you know the time of low and high tide. Someone decided long ago that Nassau, being the important spot in the Bahamas, should be the area where the tides are “accurately” calculated and most others are based off that. For example, on the George Town morning Net along with the weather, the Nassau tides are given each day. The Explorer charts have the Nassau tides going out several years, but unless you buy a new chart, eventually the tide data gets old. An oft-asked question on the Net is, “how does the tide in Elizabeth Harbor compare to Nassau?” Answer, “Ask 10 cruisers, get 10 different answers. But generally it’s the same, give or take 15 mins.” We agree. Tide times are a source of lively discussion between the Captain and his Admiral; usually “close enough” is good enough but at a time like this, going through a cut where you KNOW the water is low and you’ve never gone through before, well, it would be nice to get it right. Fortunately we’d talked to others in previous years about the cut and to Free Bird that morning who felt with our draft we could safely go through around 2pm. They needed another full foot of tide and believed that the tide at Hog Cay was roughly one half hour after Nassau, which put low at 1pm. We felt comfortable shooting for 3pm, because even though we trusted their experience we also had tide info for a spot a few miles away that indicated one and ½ hours after Nassau; let’s hedge while still being able to get into the harbor before dark. So what happens when you are sailing along briskly and comfortably? Going too fast, that’s what. The only way to slow down sufficiently was to drop the main and plod along at 4kts with only the jib. At 2:15 Free Bird passed us and we thought how brave they were and surely we’d be fine when we got there. About ½ mile away, didn’t they drop their sails, but then dropped the hook. We went ahead, me on the bow to point out any “black things in the water. The worrisome spot is only 3ft at low and while much of the cut is deep with a sand bottom, this 15 yard stretch is a rocky bottom that the water can’t cut away fast enough. This section is truly one for the books, a classic example depicted in the chart books where you need good water-reading skills, if only just for interest. After expelling a collective sigh of relief, we hailed Free Bird to say that the lowest depth was 5.3 ft. Sounded like they’d go through soon but probably anchor nearby for the night since dark would fall before they’d get back. Once past the cut we hung a left and covered twelve miles in two hours of motor-sailing and sailing in the lee of the islands, the wind out of the SE. 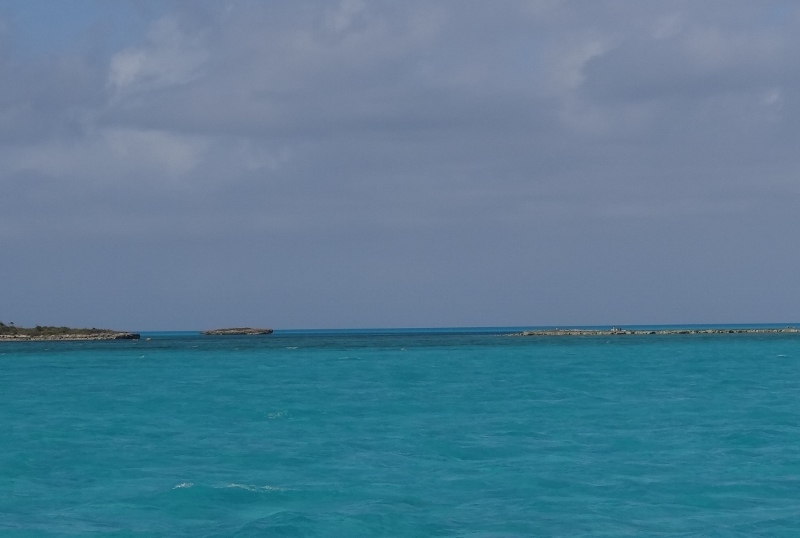 Dropped the anchor at 5:35 (sunset is 5:48), exactly nine hours after leaving Flamingo Cay. Dropped the main after the anchor to save time. All in all, a swell and interesting day on the water with no mishaps! 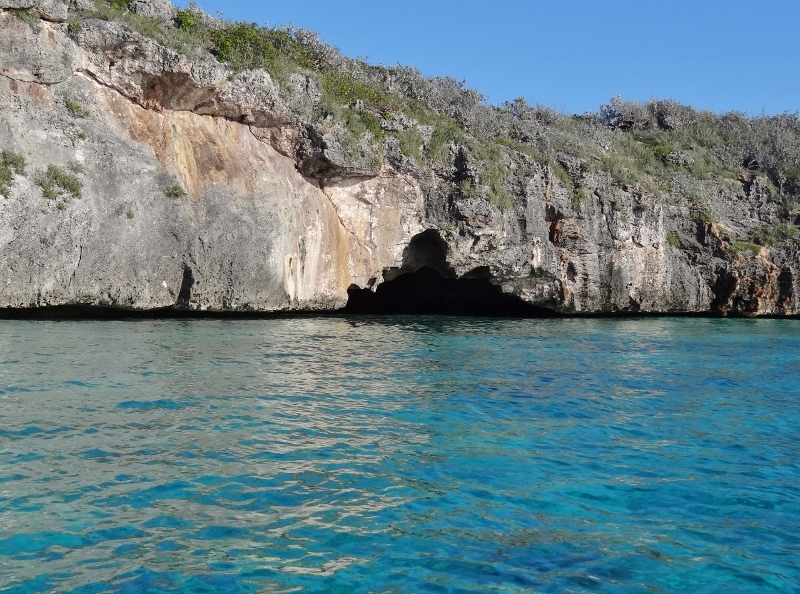 This entry was posted in Uncategorized and tagged cave, charts, sailing fun, tides. Bookmark the permalink.